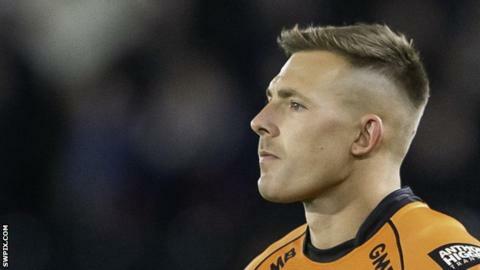 Castleford Tigers moved to the top of the Super League table as they ran in seven tries to comfortably beat London Broncos. Peter Mata'utia scored for the Tigers but Rhys Williams' try put the hosts on level terms in the first 10 minutes. Jacob Trueman, Junior Moors and Jesse Sene-Lefao extended Cas' lead prior to half-time and Liam Watts added another. Greg Eden added to Castleford's haul to extend their sizable lead, while Jordan Rankin wrapped up the victory. The Broncos named an unchanged 19-man squad going into the game as they chased a second Super League win of the season. However, despite a promising spell in the opening stages that saw Williams run in to level the scores, they were undone by a resurgent Tigers side who crossed three more times before the break. Castleford, who made three changes for the trip to the capital, continued their fine form into the second period and Watts crossed early on to add to their lead. Eden's score and Rankin's self-converted try helped the visitors keep up their 100% record in Super League this season. "It is a very tough one to take and it's lesson learned. "We did not think we could do much more, we competed well and threw the ball around, yet we went in at half-time three tries down. "Then we kept giving them too much of the ball in the second half. We kept kicking it to them." "We knew it was going to be tough here and it was. "It is a big win and it puts us in a great position after just three games. "The players have done a great job, we are showing a hard edge. The attitude has been first-class, with and without the ball, and this is a great win for us." London Broncos: Williams, Kear, Dixon, Abdull, Cunningham, Ioane, Lovell, Pitts, Adebiyi, Fozard, Fleming, Morgan, Yates. Replacements: Battye, Pelissier, Richards, Mason. Castleford: Mata'utia, Clare, Minikin, Shenton, Eden, Trueman, Watts, McShane, Millington, Massey, Sene-Lefao, Rankin, Clarkson. Replacements: Milner, Moors, Cook, Egodo.